Planning a surprise birthday or hens party for your family member or friend and want it to be a memorable one? Then hiring a party bus from a reliable and professional private listed company is recommended. Locals or tourist here favors this affordable and hip transportation services that offers fun and cool rides across the country and even across the border, Malaysia. MaxiCABooking SG provides reliable yet affordable party bus services to tourists and local residents at standard flat rates with no hidden charges assured. All our rates and packages are as per stated in our party bus rates and packages and won’t fluctuate with surging rates whenever there are high demands for party bus services. MaxiCABooking SG strives to provide dedicated party limo bus services, to ensures our customers enjoy their party bus rides to their destination, even in the hectic and busy roads of Singapore. Our vehicles are scheduled to go for regular servicing and maintenance so you our value customers can be assured a safe and happy travel experience onboard our party bus fleet. Our call center are available 24hrs to attend to any enquiries and help customers to select the right package and services according to their events or private mobile party requirements. And our operations department will handle all bookings professionally so as to send vehicles to their respective designated pick up location as per our customers scheduled bookings. To ensure that your special event are a memorable one, it is important to pen down your planned activities in advance. Our party bus for event package rates helps party planners or event companies to choose and plan for their clients well so as not to spend out of their budget even before the start of their event. Simply read through and choose types of transfers or packages that suits your client itinerary, click and confirm with no-hassle or complication. Number of maximum passengers are also stated with types of party bus, rate and services to help customers choose the right packages required for their event or client’s. So you won’t be in situations whereby the party bus booked for example on hourly or daily package are not fully utilised for the said event. When checking out our wide services and packages, be sure to scroll down and read through all so as to select the most suitable package for your mobile party. And in the meantime be sure you check for the best possible promotion deals available during special occasions like Christmas, New Year and so on. Choose party bus types that could well accommodate your family and friends comfortably whether for a long or short distance journey. Once you have selected your preferred type of party bus and services, provide your full name or contact person for our driver to call upon reaching pick up location. This is so our driver could contact and liaise or be directs to your exact location, but do ensure to check the vehicle number are as per provided before boarding vehicle. Just follow this three simple steps and your party bus rides are sure to be a smooth and a memorable one with drivers who are fluent in local languages, friendly and will definitely get you to your party location on time. MaxiCABooking SG also provides extra services such as purchase of drinks in advance at pub rates but BYOB is also allowed with no extra charges. 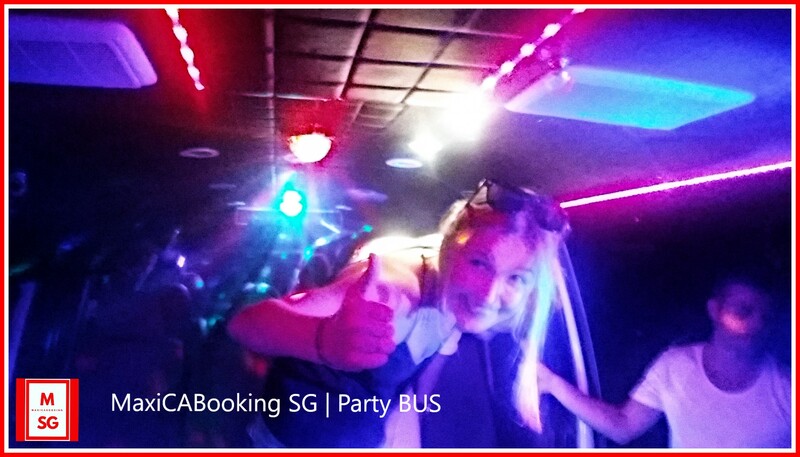 This entry was posted in Party BUS, Party Bus Booking and tagged disco taxi services, party bus, party bus booking, party bus bookings, party bus for bachelor party, party bus for birthday, party bus for events, party bus for hens party, party van hotline, singapore party bus. Bookmark the permalink. ← Why Choose a Party Bus for Traveling?